Size: Arthropod is 3.7 inches long! 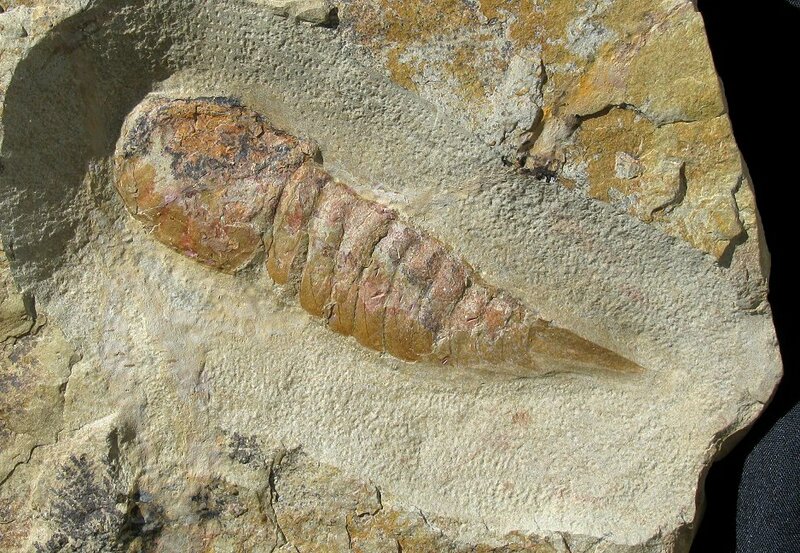 Here is an extremely rare trilobite-eating organism, identified as Leptaglaspis schmidti, a Xiphosurid. This enigmatic animal is one of the rarest and most collectiblel organisms to be found in these Ordovician layers. There is a HUGE, COMPLETE specimen preserved on the plate - it is textbook, with the head, thorax, and telson extremely well preserved. The detail of the segmentation and pleurons is amazing - this is one of the rare ones with nice detail preserved! The NATURAL red-orange color is quite beautiful and very easily seen. This is a very large, top quality specimen of this strange and little-known arthropod from the Ordovician of North Africa. This fossil was collected and obtained legally, and is also being sold legally. A Certificate of Authenticity from EXTINCTIONS is included with this specimen.